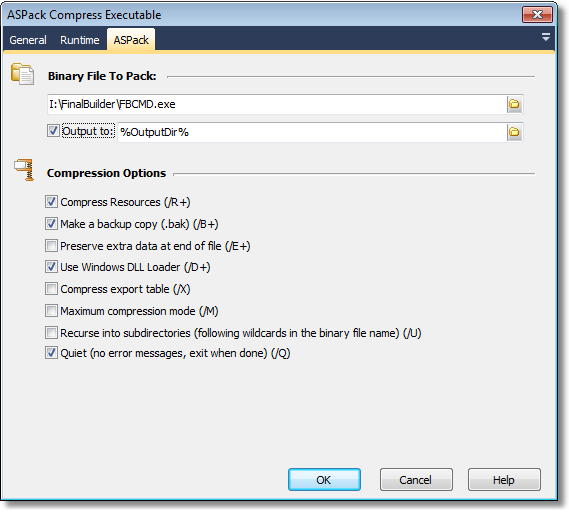 The ASPack action uses the ASPack utility to compress a binary executable or library file. For more information on ASPack, see the ASPack website http://www.aspack.com/. Specify the name of an executable or library file to packed. Optionally, you can also specify an output path for the packed file. Each of these options corresponds to a different ASPack command line option (each switch is shown in the label for the checkbox.) See the ASPack documentation for more details. It is not recommended that the "Quiet" option is unchecked when running automated builds, as this may lead to ASPack pausing and displaying a modal dialog.